In December 1949, Chairman Mao Zedong visited the Soviet Union and signed an agreement that the Soviet Union would fully assist China to build the first autombile plant. 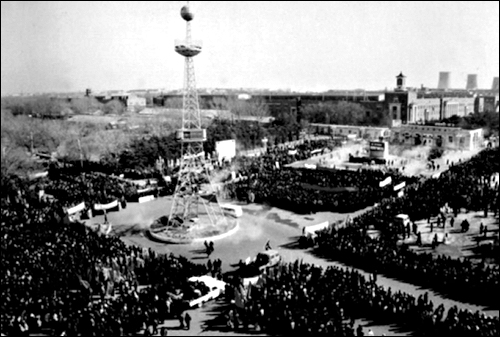 After more than a year of research, in 1951, the Central Committee of the Communist Party of China and the Central People's Government decided to locate the site of the first automobile manufacturing plant in the suburb of Xue in the Jilin province. On July 5 of 1953, a grand ceremony was held on the site of the first Chineese automobile manufacturing plant. Chairman Mao Zedong personally inscribed the name of the factory. On July 13 1956, the first truck left the new Changchun First Automobile Factory. It was based on the Soviet ZIS 150 and modified to suit specific Chineese conditions. The vehicle was equipped with a 90-horsepower, six-cylinder petrol engine with a top speed of only 65 km/h and a payload of 4,000 kg.